This is my favorite outfit right now: a cozy wool skirt with an extra warm turtle neck. Its icicle-on-your-nose cold and the wind whips your cheeks until they're raw right now in New York. I just want to be bundled up with a second pair of knit tights and a hat, even inside, listening to records. W hen I do have to go outside, I'll keep warm in my thrifted faux fur and a beanie I stole from Rich. Maybe it's 'cause I live in the south, but I have never been in to turtlenecks! However, you look absolutely gorgeous in one and I love your low cut Docs! you look absolutely perfect. 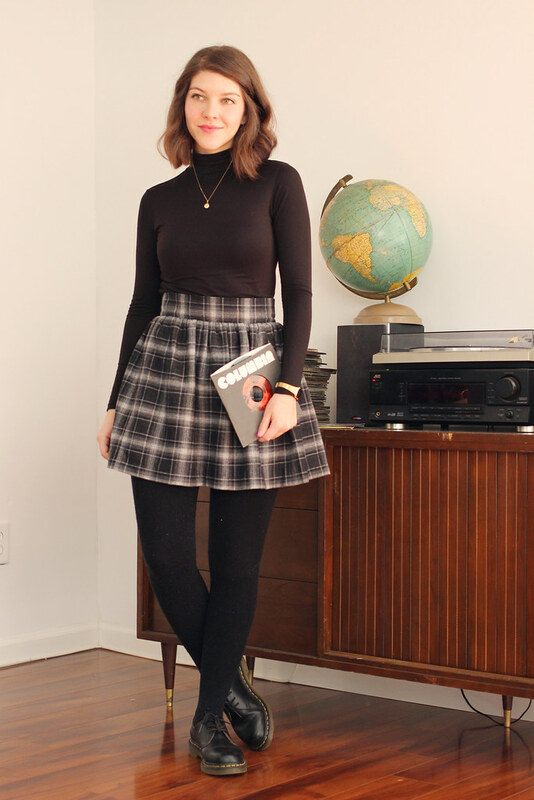 Turtle necks plus plaid skirts are a match made in heaven. 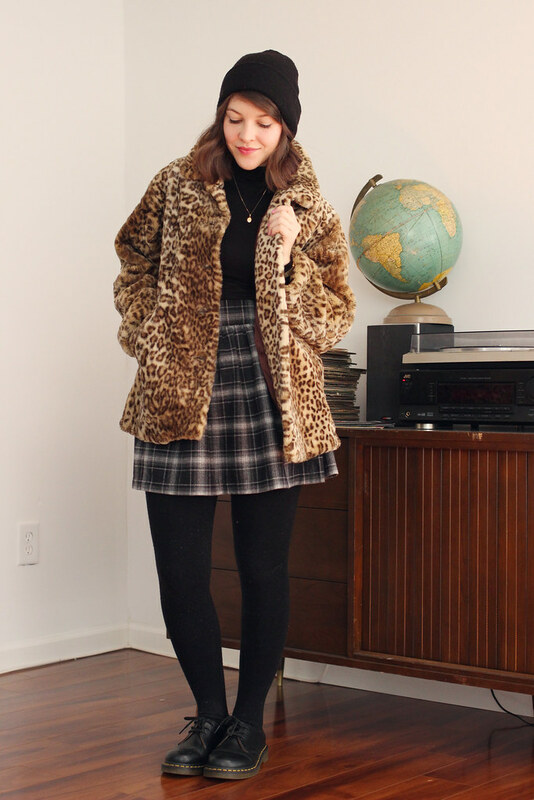 Cozy, ladylike, timeless - and then badass with the leopard coat and docs! Perfect winter outfit. Did you lighten your hair? It looks great! 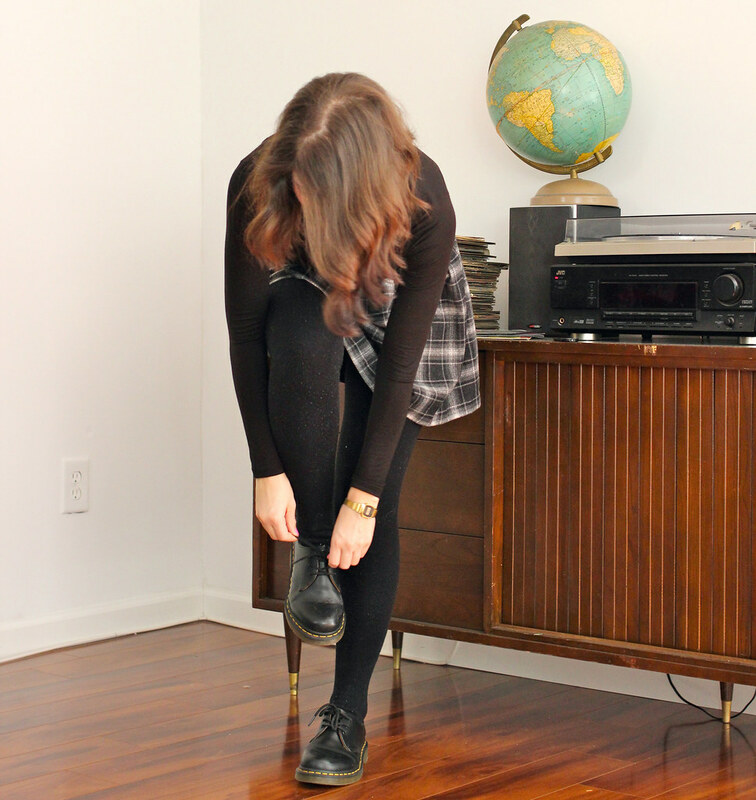 Love the outift (and that is a perfect vintage globe). This is THE cutest outfit, I love your hair! As I know these knit tights , they saved my life in this winter!! Ugh I just wear them on top of my other tights. The crazy things we do to look cute and stay warm! No, I just let the black grow out. ALMOST THERE! Its all my natural color except, obviously, the odd black bits at the bottom. Aw thanks! I'm styling it differently, its so much easier this way! Thanks! Its a kids coat hahaha, I just love that. It is rare for me to see someone wearing 4 eyelet Docs. I used to have 8 eyelet ones for a LONG LONG time until I finally started blistering (I currently own maryjane ones I've had for a decade or more and a pair of canvas red ones).